Total Pro-Life Immersion for High School Youth – Registration Now Open! 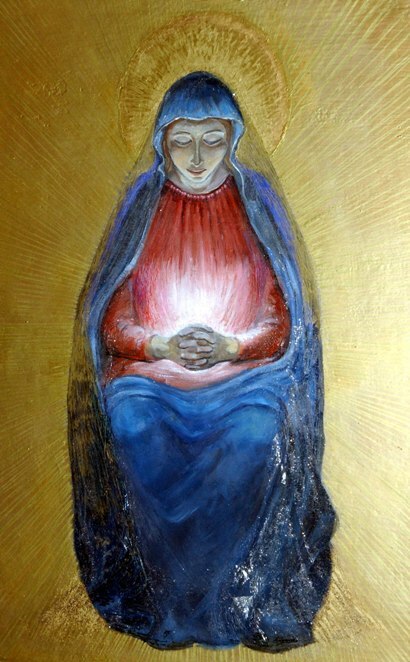 Following Vatican approval, the “Rite for the Blessing of a Child in the Womb" is now available for use by dioceses in the United States. . . . “We hope the use of this blessing will provide not only support and God's blessing for expectant parents and their child in the womb, but also another effective witness to the sanctity of human life from the first moment of conception,” said Archbishop Gregory M. Aymond, chairman of the Committee on Divine Worship of the U.S. Conference of Catholic Bishops (USCCB). The blessing [available here] can be offered within the context of the Mass as well as outside of Mass [including at Mass on Mother’s Day!]. given life – a mother – than to give a gift of life? Click here to send a Mother’s Day E-Card to your mother, grandmother, wife, sister, daughter or friend who has given the precious gift of life. With a donation of any amount, you can honor a mother you care about and help save more lives through the CPLC’s nine ministries. You may also make a donation in memory of a loved one for whom a Mass will be offered here. 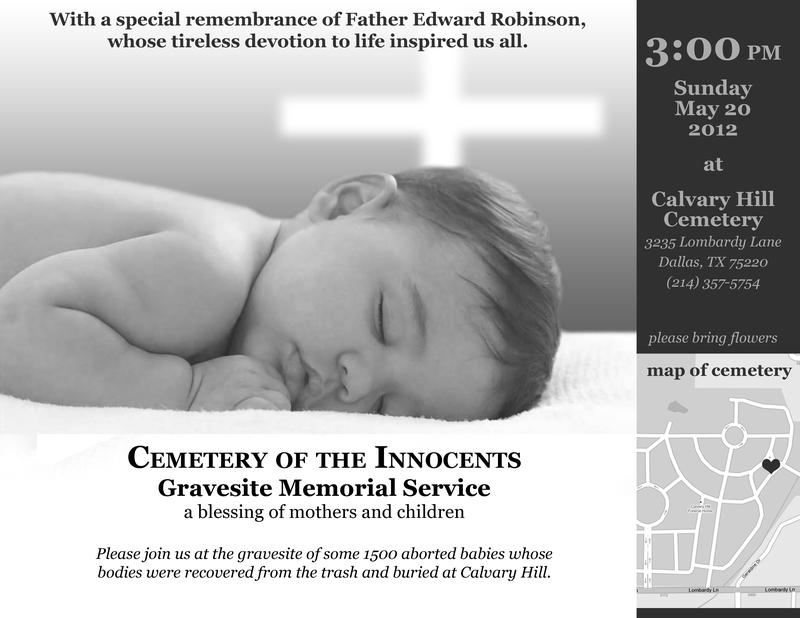 Cemetery of Innocents Gravesite Memorial Service – with special remembrance of Fr. Edward Robinson, O.P. Please join us at the gravesite of some 1,500 aborted babies whose bodies were recovered from the trash and buried at Calvary Hill. The service will include a special remembrance of Father Edward Robinson, O.P., whose tireless devotion to life inspired us all. Fr. Robinson passed to his eternal reward on March 29 and is buried just a few feet from the babies. Please bring flowers. Gather in present or private prayer, as we supplicate for LIFE from conception to natural death. Sponsored by St. Elizabeth of Hungary Parish; St. Gabriel Ministry to the Imprisoned and St. Gabriel Pro-Life Ministry. For more information on Church teaching on capital punishment, please click here. Should We Boldly Go Where No Man Has Gone Before? Youth For Life Pro-Life Boot Camp is one of the best opportunities for young people (high school, ages 14-17) to become involved in the work of the pro-life movement. The CPLC, together with Catholics Respect Life in Fort Worth, is offering two Boot Camp sessions of total pro-life immersion: Session 1 is a weekend version, June 29 - July 1, and Session 2 is 5 days, July 27 - 31. Activities include praying at abortion centers, talks from experts, skits, testimonials, Mass and the Sacraments, and volunteer projects. Both sessions will feature Father Tadeusz Pacholczyk, Ph.D. from the National Catholic Bioethics Center. It’s hard to not sound over-the-top in describing how much of an outrage it is that the speaker at Georgetown University’s School of Public Policy diploma ceremony on May 18 will be none other than Health and Human Services Secretary Kathleen Sebelius. Editor's Note: The 5th Circuit has scheduled oral argument on June 4 on the state's appeal of the ruling halting the enforcement of Planned Parenthood's defunding. Please join us in prayer for these proceedings. "President Obama’s comments [yesterday] in support of the redefinition of marriage are deeply saddening. As I stated in my public letter to the President on September 20, 2011, the Catholic Bishops stand ready to affirm every positive measure taken by the President and the Administration to strengthen marriage and the family. However, we cannot be silent in the face of words or actions that would undermine the institution of marriage, the very cornerstone of our society. The people of this country, especially our children, deserve better. Unfortunately, President Obama’s words today are not surprising since they follow upon various actions already taken by his Administration that erode or ignore the unique meaning of marriage. I pray for the President every day, and will continue to pray that he and his Administration act justly to uphold and protect marriage as the union of one man and one woman. May we all work to promote and protect marriage and by so doing serve the true good of all persons."